After a failed geoengineering attempt to fix climate change leaves the earth in an everlasting winter, the last humans in Bong Joon-ho’s new sci-fi thriller, Snowpiercer, survive aboard a high-speed train that circumnavigates the world. Based on the French comic book, Le Transperceneige, by Jacques Lob, Bong’s film depicts a post-apocalyptic society that manages to neatly retain its class divisions by separating people into train compartments. The poorest live in the tail of the train, where food and health care are scarce and punishment and exploitation are abundant, while the wealthiest enjoy a life of luxury hundreds of carriages away at the train’s head. After enduring a final intolerable injustice, the denizens of the tail embark on a brutal battle to push to the front and take over the engine. Bong, whose previous work includes the horror films The Host and Mother, portrays a multi-racial future with an international cast featuring Chris Evans, Jamie Bell, Octavia Spencer, Song Kang-ho, Tilda Swinton, Ko Ah-sung and Ewen Bremner. 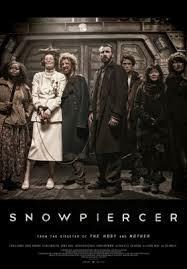 Snowpiercer is a bleak, yet thrilling ride with deeper class and environmental implications that explores the burdensome choices people are willing to make to survive. Snowpiercer abounds with allusions to food and eating. Here is a recipe of related Library items to whet your appetite before viewing the film, which unfortunately has a very limited release.